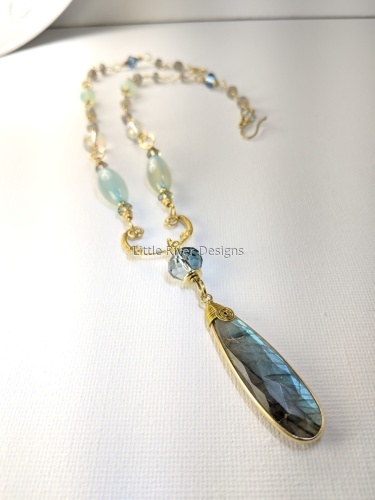 This work of art is a handcrafted sterling silver and turquoise stone necklace intergrated with silver and Swarovski crystal drops and connectors. 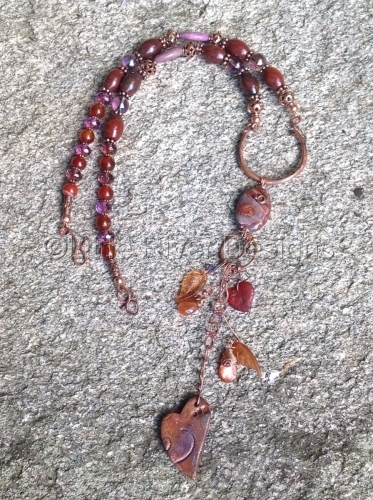 Handmade Ceramic Heart dangling from a handcrafted copper chain with autumn leaves and copper wrapped sunstones. 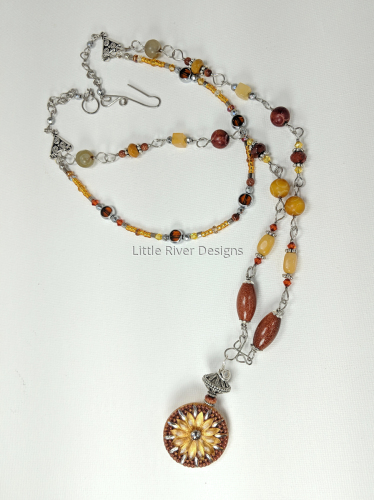 Carnelian, red agate, bird's eye rhyolite and crazy lace agate complete this necklace. A tribute to the autumn season this is a 28 inch necklace overall. A pair of copper wrapped sunstones handmade earrings complete the set. Sun reflecting on the water, This is a faceted labradorite teardrop in gold vermeil 14x45mm accented with blue agate and handmade labradorite links. 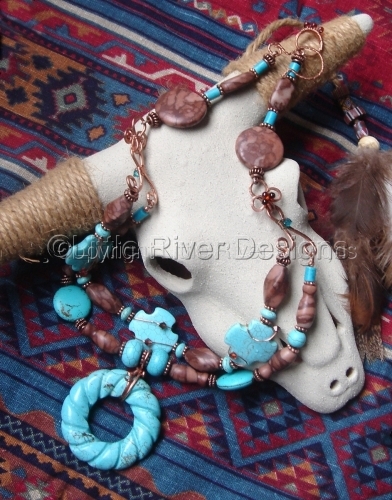 This is a handcrafted turquoise and zebra stone two tiered necklace with an approx length of 24 inches including pendant. 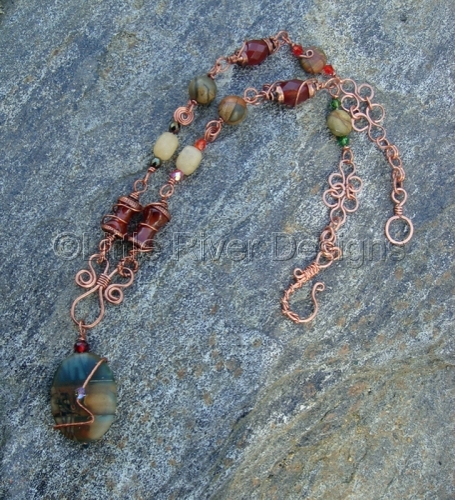 This necklace is wire wrapped in copper with copper accents. 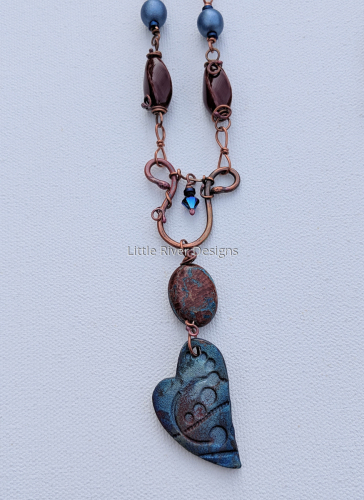 Warm coppers and browns hung beside cool dusty blues on this 22 inch handmade clay heart necklace. Chevron hematite with jasper and Swarovski crystal. 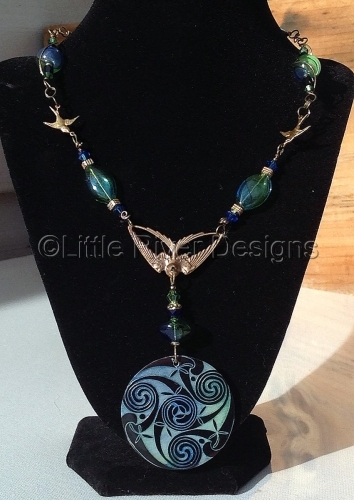 Handpainted one of a kind ceramic African Kazuri, Swarovski crystal necklace wire wrapped in brass. approx. twenty five inches in length. 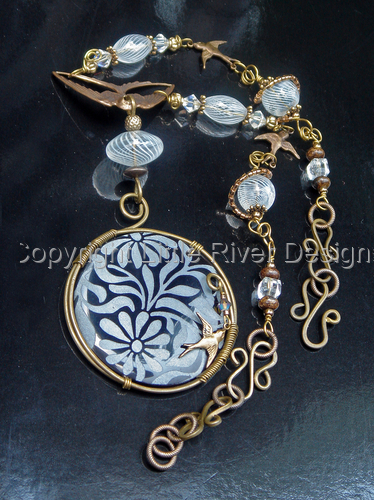 This is a sixteen inch necklace wire wrapped in antiqued brass. 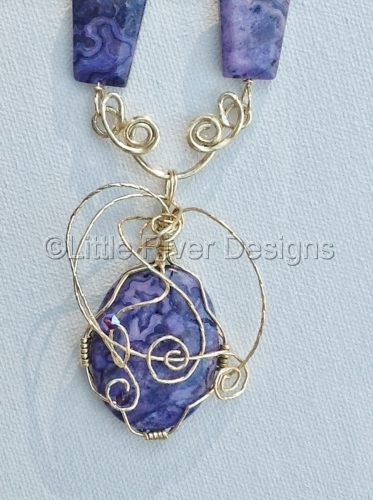 It has a two inch Brioche Agate pendent making the total necklace length eighteen inches. 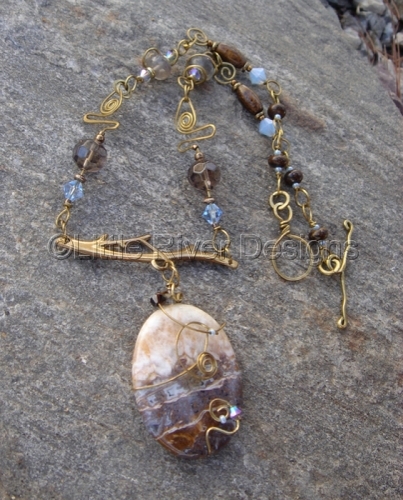 Others stones include Smokey Quartz, Bronzite and Labradorite highlighted with Swarovski Crystals. Price includes both pieces. I designed and built this in January, hence the name of the necklace. A hammered brass wire wrapped artistic stone pendant hung from a mix of black ornyx, pearl, antigued brass, serpentine stone and botswana agate to name a few in the mix. 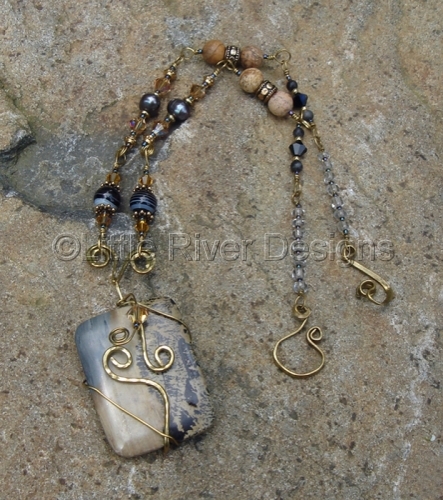 Brass wire wrapped artistic stone pendant hung from a 18 inch necklace of hammered brass, fresh water pearls and jasper. 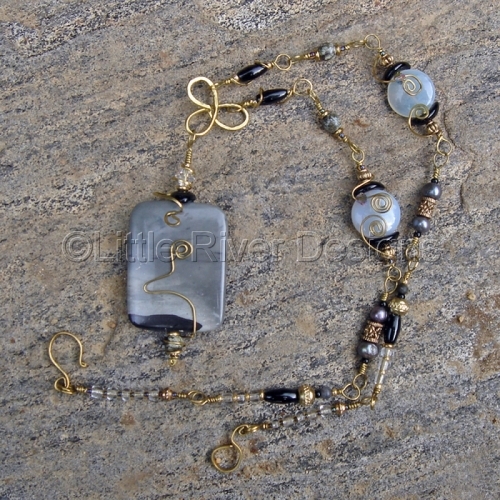 Handcrafted to match the Black and Tan Necklace, with jasper and fresh water pearls. 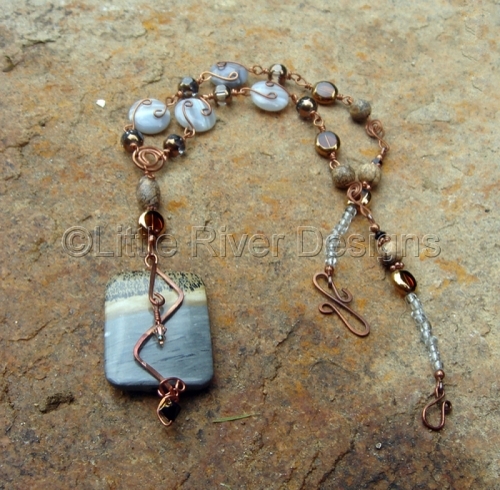 Copper wire wrapped artistic stone with wire wrapped botswana agate and picture jasper accents. 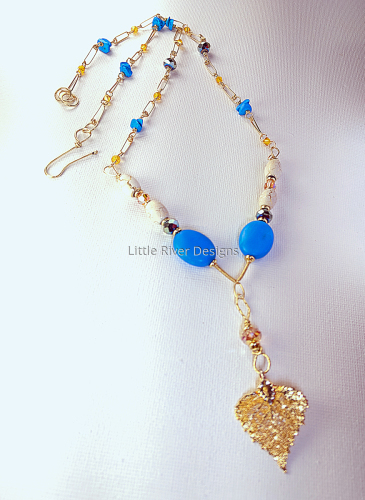 A tab shell pendant with Venitian glass beads,wrapped in caramel brass with brass and Swarovski crystal accents. 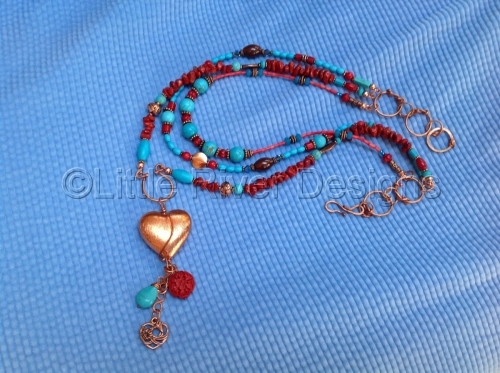 An 18 inch necklace with 2 inch pendant drop. 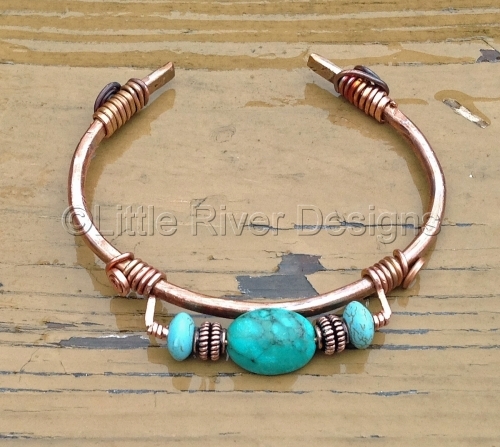 Hammered copper cuff bracelet with turquoise magnesite accents. 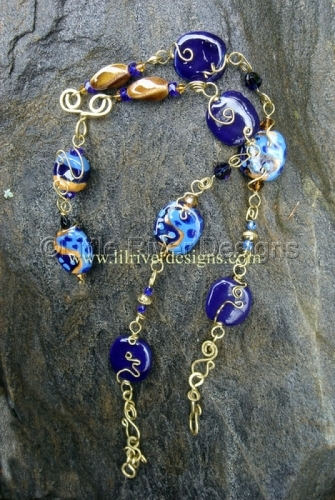 Inspired by the Down East coast this chain and wire wrapped necklace is twenty eight inches in length over all. 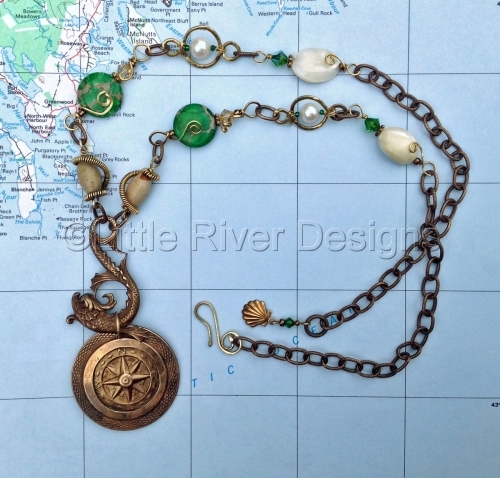 It is accented with fresh water pearl, mother of pearl and aqua terra centered around a custom designed compass pendant. 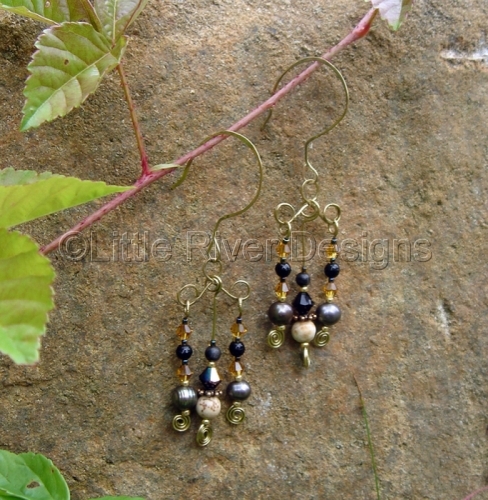 Aqua terra stone dangles with brass and fresh water pearls from hand made wires 3 inch drop. 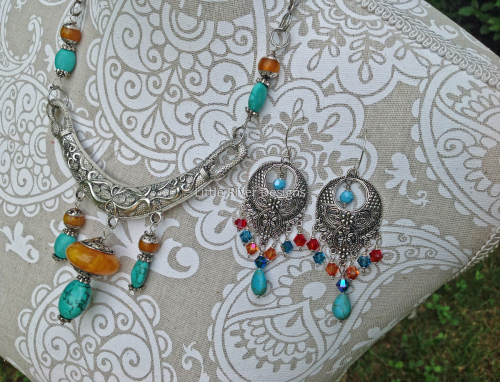 Tibetan silver and amber focal drop accented with turquoise and a handcrafted steel chain. 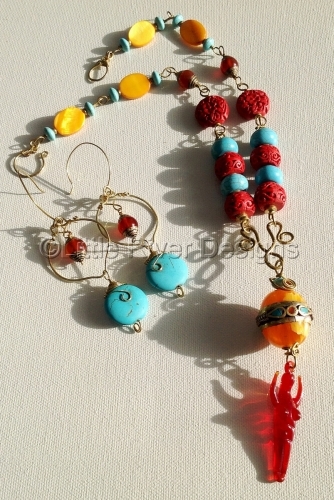 Earrings included focal drops of Swarovski crystal. 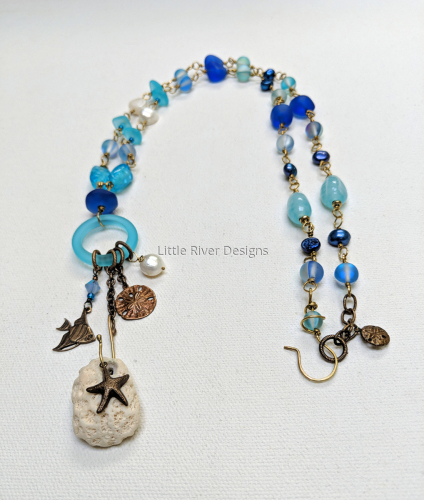 Beach combing I found this coral naturally holed by sand and waves turned into a beautiful charm necklace of recycled glass and pearls in the hues of the sea with ocean inspired bronze charms. Golden fall birches against the crisp autumn sky, A 24k gold plated birch leaf with blue as the sky, dolomite and swarovski crystal on a handmade chain. Handmade sterling and steel chain softened with the colors of autumn this is a 30 inch double tiered necklace of Jade and goldstone.